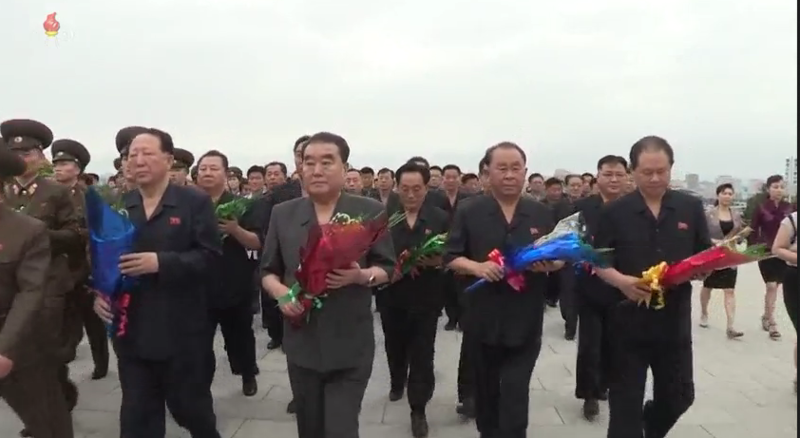 Senior WPK officials deliver floral bouquets to the Kim statues on Mansu Hill on July 8, 2018 including: former Second Economic Committee Chairman Jo Chun Ryong, WPK Munitions Industry Department Deputy Director Hong Sung Mu, WPK Vice Chairman and Munitions Industry Department Director Thae Jong Su, WPK Munitions Industry Department Deputy Director Yu Jin, head of the Operations Command Group in the Personal Secretariat and WPK Central Committee Department Senior Deputy Director Ri Pyong Chol and WPK Munitions Industry Department Hong Yong Chil (Photo: Korean Central Television). 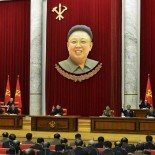 During January 8 (Saturday) and January 9 (Sunday), officials of the Workers’ Party of Korea (WPK) and DPRK Government, officers and service members of the Korean People’s Army (KPA) and the internal security services and DPRK citizens marked the 24th anniversary of the demise of DPRK President and founder Kim Il Sung (Kim Il-so’ng) by delivering floral baskets and bouquets and paying their respects at KIS and Kim Jong Il (Kim Cho’ng-il) statues and icon monuments. Floral basket from Kim Jong Un in front of the Kim statues near the Museum of the Korean Revolution on Mansu Hill, Pyongyang (Photo: KCTV). 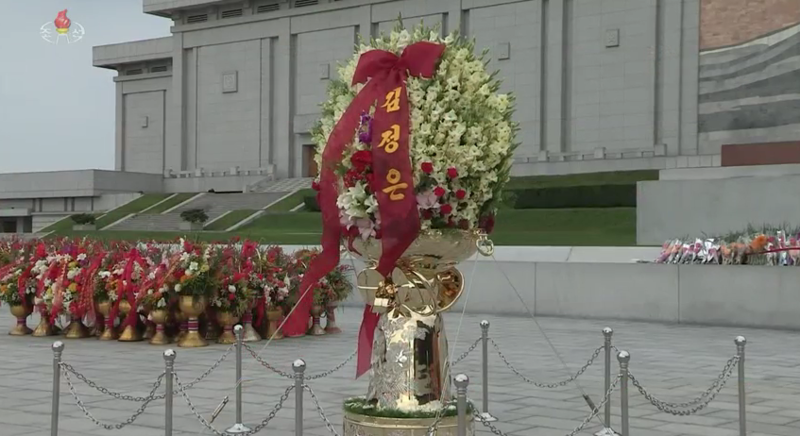 A floral basket from Kim Jong Un (Kim Cho’ng-u’n) was placed at the base of the KIS and KJI statues in front of the Museum of the Korean Revolution on Mansu Hill in central Pyongyang. Also delivered there were floral baskets from the WPK, the KPA, various DPRK Government institutions, workers’ and social organizations, KPA and Korean People’s Internal Security Forces units and various industrial sites, production units and schools based in Pyongyang. A floral basket from the Anti-Imperialist National Democratic Front’s Pyongyang office was also sent along. 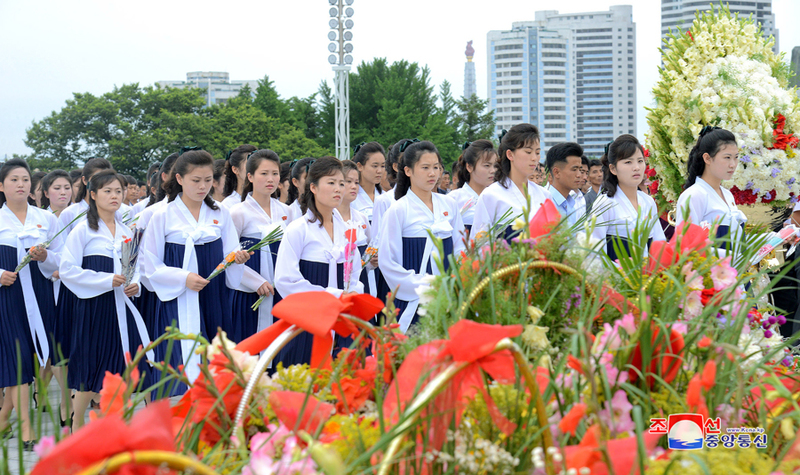 Similar floral presentations and gatherings were held throughout Pyongyang at Mansudae Art Studio, Kim Il Sung University, the Ministry of the People’s Armed Forces, Kim Il Sung Military University and other locales, as well as in provincial capital cities, county seats and other administrative divisions throughout the DPRK. 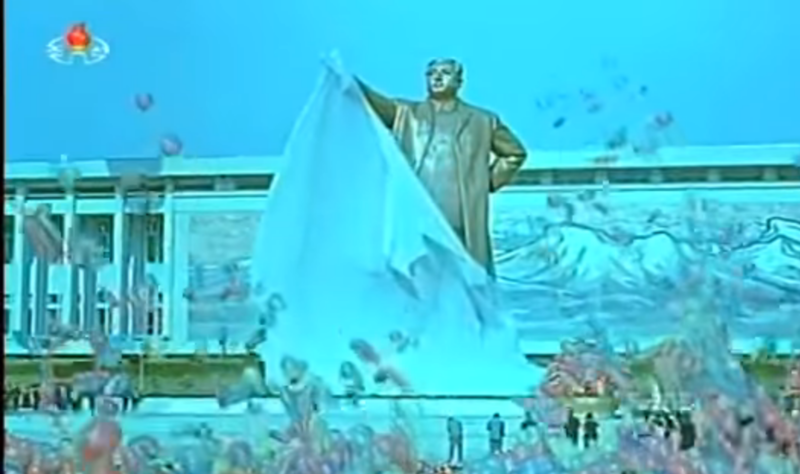 The unveiling of the Kim Il Sung statue on Mansu Hill (Photo: KCTV). This article was written on 10 Jul 2018, and is filled under 2nd Academy of Natural Science, basic party organizations, Central Committee, Central Military Committee, corps command, county/city party organizations, Culture Section (bureau), DPRK Cabinet, DPRK External Relations, DPRK films, Executive Policy Bureau, Fatherland Liberation War (Korean War), Film Bureau, Gen. Ri Pyong Chol, General Federation of Science and Technology of Korea, General Federation of Trade Unions of Korea, gsd, Guard Command, Hong Sung Mu, Hong Yong Chil (KWP MBID), ideological slogans, Ideological Works, Inspections (PAD), internal security, Jo Chun Ryong, Kim Family, Kim Il Sung Youth League, kisyl, KJI Personal Secretariat, KJI/KJU Ideological Works, Korean Children's Union, Korean Democratic Women's Union, Korean People's Internal Security Forces, Korean People's Army (KPA), Korean Workers' Party (KWP), KPA basic party organizations, KPA branch party organizations, KPA construction battalions, KPA construction brigades, KPA General Political Bureau, KPA General Political Department, KPA General Staff, KPA Large Combined Units, KPA Party Life, KPA supernumerary organizations, KPA WPK Committee, kpif, Local Party Affairs, local people's committees, Machine Building Industry Department, Mansudae Art Studio, Minister of People's Security/KPISF construction units, Ministry of Culture, ministry of people's security, Ministry of State Security, Ministry of the People's Armed Forces (MPAF), MPAF GPB, MPAF Revolutionary Museum, National Academy of Defense Sciences, North Korean press, Organization and Guidance Department, Party elders, Party History Institute, party life, Party Life Guidance, Political Bureau, primary party committees, Propaganda and Agitation Department, Provincial Party Committees, Provincial Party System, Provinicial People's Committee, Public Events, Publication Guidance Bureau, Pyongyang City People's Committee, Pyongyang WPK Committee, rural management committees, Second Economic Committee, Second Economy Commission, Secretariat, South P'yo'ngan KWP Provincial Committee, South P'yo'ngan Provincial People's Committee, State Affairs Commission, State Security Department, Supreme People's Assembly, Tae Jong Su, uawk, Workers' and Social Organizations, Yon Hyong Muk, Young Red Guard, Youth Shock Brigades.